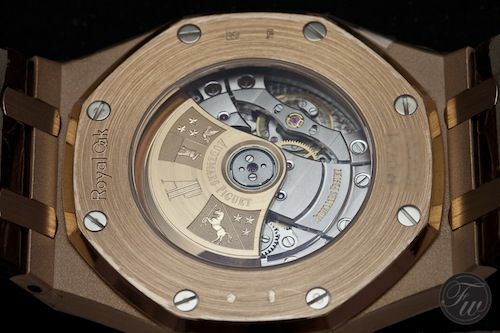 In 1993, 21 years after the introduction of the Royal Oak, Audemars Piguet introduced the Royal Oak Offshore. It was time for an evolution regarding the Royal Oak collection, to make it more rugged, more sporty and – perhaps – younger. 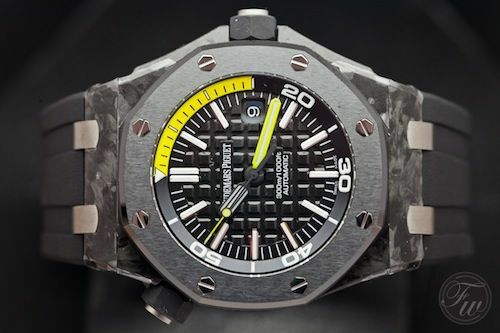 The Offshore is the most popular Audemars Piguet collection without a doubt. Some purists though, might prefer the ‘normal’ Royal Oak collection as it is more or less an understatement, and yes, closer to the original design of 1972. History aside, we assume you know most of the stuff already, we were in the opportunity to have a closer look at the Royal Oak Offshore Diver made out of forged carbon. The Offshore collection is pioneering with exotic materials ever since the very first models and forged carbon is one of them. 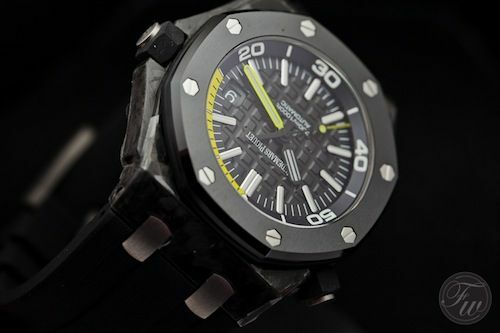 In 2007, Audemars Piguet used forged carbon for the very first time with their Royal Oak Offshore Alinghi Team model. A few years ago, the Royal Oak Offshore Chronograph ‘Bumblebee’ was also made out of forged carbon and was extremely popular. 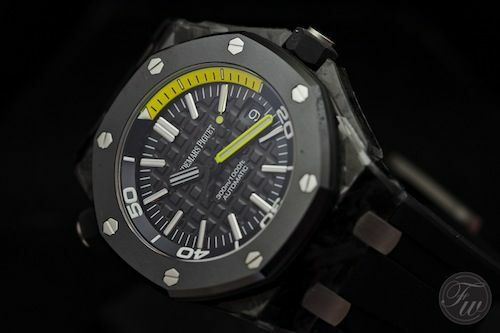 This time, Audemars Piguet used the popular Royal Oak Offshore Diver (ref.15703, we reviewed it here) as a basis and transformed it into this forged carbon version, ref. 15706AU. 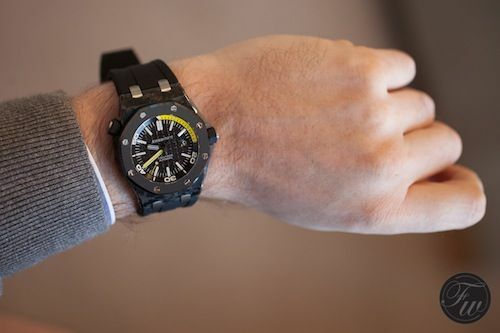 The introduction took place during SIHH 2012 but was over snowed with the introduction of the new ‘Jumbo’ ref.15202 watch. Just recently, we had the opportunity to fiddle around with the Royal Oak Offshore Diver 15706AU ourselves and so we did. One of the things that immediately comes to mind is the clever use of scratch resistant (black) ceramic for its bezel. We’ve had our share of dents in our own AP Royal Oaks, seen some pretty beaten up ones from others as well and with the Offshore it is even worse in most cases. Because the Offshore case is bigger and thicker, it is easier to bump into something with it. Like a extreme sports watch should in our opinion, there is no transparent caseback. 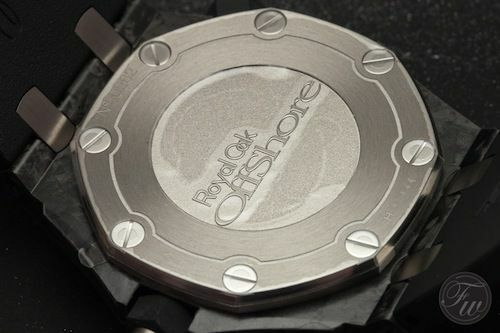 Just the ‘Royal Oak Offshore’ engraving we’ve seen on the previous Diver models and other Offshore models as well. Inside, in-house developed movement caliber 3120 is fitted. This movement was introduced to the market in 2005 for the very first time, in the – then new – Royal Oak 15300. The picture we show you, is taken from the new 15400OR model, but is exactly the same movement. Although we have a weak spot for the caliber 2121 movement of the ref.15202 Royal Oak ‘Jumbo’, we do like the caliber 3120 a lot. It also has become the base caliber for the Royal Oak Offshore chronograph models, where AP added a chronograph module on top. Not the most elegant solution for a chronograph timepiece, but at least the use superb movements. Are there things we would rather have seen differently? Well, now we ask. Yes. We are not sure as we are no designers, but the bolts in the bezel have a lot of contrast with the bezel as a different material is used for them (white gold?). Same goes for the links that connect the rubber strap to the forged carbon case. 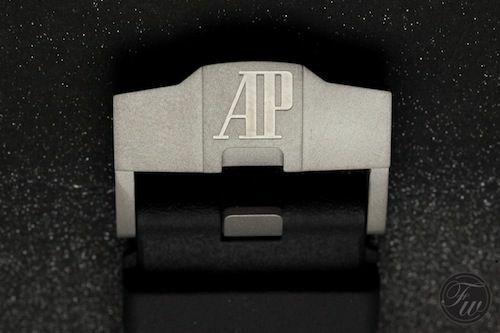 Again, we aren’t designers but we wonder how it would have looked if AP had chosen a different material for these parts. With a case diameter of 42mm, this is a perfect sized Royal Oak Offshore. In the meanwhile, we’ve been able to try the whole range from the 39mm classic Royal Oak, to the 41mm new Royal Oak models and even the 44mm Royal Oak Offshore collection. For the sporty Offshore, we really love the ‘modest’ size of 42mm. Something we love from other / previous models (15703, the Scuba Wempe and Scuba Boutique models), is the Méga Tapisserie dial. 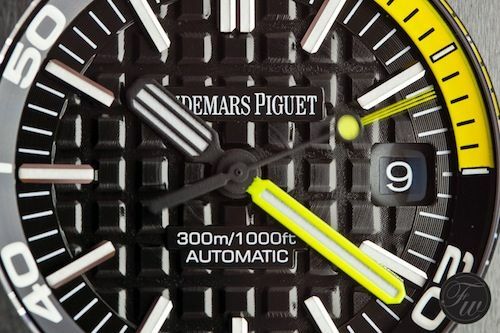 Completely different from the very elegant Clous de Paris on the Royal Oak ‘Jumbo’, the Méga Tapisserie pattern really fits to the tough 300 meter diving watch from the Offshore collection. The Ref.15706AU Royal Oak Offshore Diver in Forged Carbon comes with a very soft rubber strap with a titanium tang buckle with the AP logo engraved. As already mentioned, we’ve found the rubber strap to be extreme comfortable and we do prefer a tang buckle over a folding buckle for rubber and (alligator) leather straps. 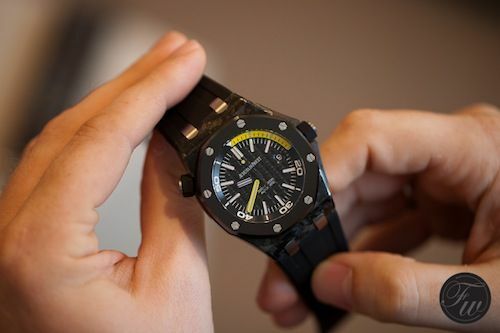 The Royal Oak Offshore Diver Forged Carbon is available for 22.870 EUR (excluding VAT).